This type is very similar to CE4a; however, it has smaller-sized elements and is finer-grained. Structure: Occasional fluidal arrangement of grains. Matrix: More translucent than CE4a. Grains: 20 %, pale and shiny, rounded and irregularly shaped, contained between 80 and 250 µ. 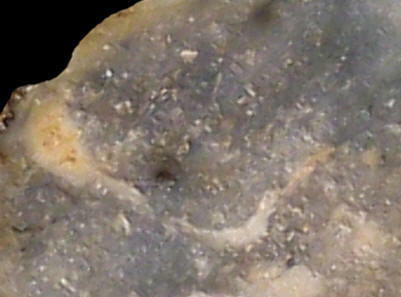 Grain composition: identical to that of CE4a; no glauconite. 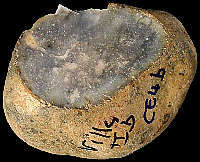 Other types of flint: The flint here constitutes quite a mixed lot, with predominantly Late Cretaceous material like CE1a, CE1b, CE1c, CE2, CE3, CE4a, and CE5, but also Hauterivian (Early Cretaceous) material of the Ht3-type. Geographical description: The designation of the sample is somewhat deceptive, as the administrative boundaries are slightly confusing around here. The sample was collected on a field, not half a kilometre to the west of the hamlet of Mussel, which lies on the D 25 road directly to the south of Bellegarde-sur-Valserine. Co-ordinate precision: The given coordinates are within 50 to 100 metres from the actual locality, as they were taken from a large-scale map. To prevent the introduction of additional errors, we transformed the Lambert-coordinates to Latitude/Longitude and give the exact figures, but they might be off in the same magnitude, so give or take a second or two. Geology: As with the other locality with this type of flint the geological map indicates the substrate to be of Early to Middle Miocene age (without distinction between Burdigalian and Helvetian), unit m1b-2a, but the flint contained all originates from Late Cretaceous parent-rock.